If you ever need to edit a document of any sort including a contract or agreement and want your changes and comments to standout, the Track Changes feature in Word 2010 has no equal… Really. It’s that good. If you’re an attorney or contract specialist, you probably already know this from previous versions of Word but if not, pay close attention and let me introduce you to the Track Changes feature of Word 2010 found on the Review Tab of the Ribbon. To start out, you need some initial content. This can be something that you’ve written or perhaps you’re a teacher so grab one of your students papers you need to edit. Track changes will look at ALL changes done to a document so you can be as creative as you like with your content. Select the Review tab and then Click Track Changes. Adding comments is an easy way to communicate points that need clarification or just a general comment. Comments will appear on the side of the document but won’t appear in the final draft. 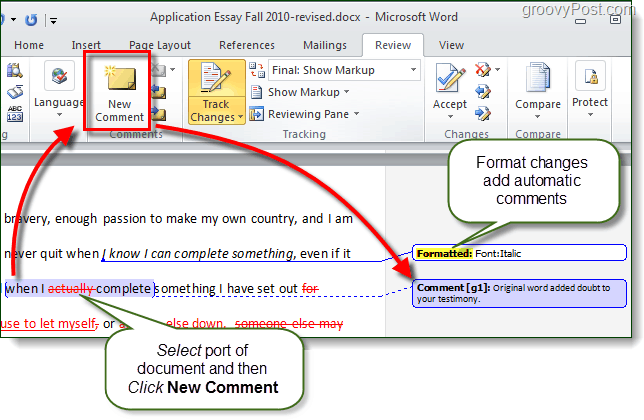 To Add a comment, Select a portion of the document and then Click New Comment. * A box will appear on the right-side that you can type in to convey a particular message to concerning the editing. *Note that format changes such as adding bold, italic, underline, etc… will result in an automatically created Comment labeled Formatted. You can also add Balloons, which are system generated comments that will display editing actions taken on each part of the document. Showing revisions in balloons is my is actually my preferred method for editing and reviewing documents. These balloons will change depending upon whether you are viewing the “Final: Show Markup” or the “Original: Show Markup”. To do this Click Show Markup > Balloons > Show Revisions in Balloons. 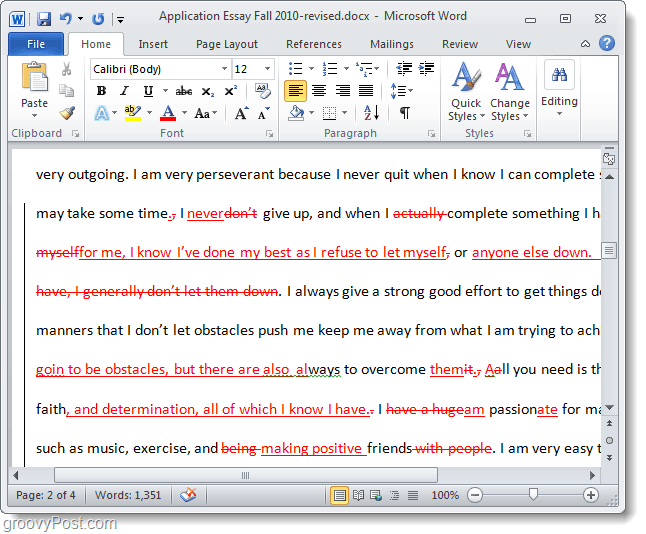 If you edit a document and then change your own user name, Word will consider you an entirely different author and you can then edit the document using multiple colored markups. If you do this you need to remember the exact user name you used for each color because using anything different will just create a new author (and color). With the document fully edited you are ready to start accepting or rejecting changes. There are two different places to do this; the Review ribbon Accept button, or the Right-Click context menu option. Additionally, from the ribbon you can skip ahead and Accept All Changes in Document to completely to instantly change the document according to all of the markup. You can use the Compare tool to view documents side-by-side and see what differences there are between them. This will work with ANY two documents, but it is only really useful for documents that are similar or have been modified. Below I loaded both the original version and the finished revised version for comparison. The comparison window is huge, but it will display every difference and will automatically open the Reviewing Pane to help you track changes easier. 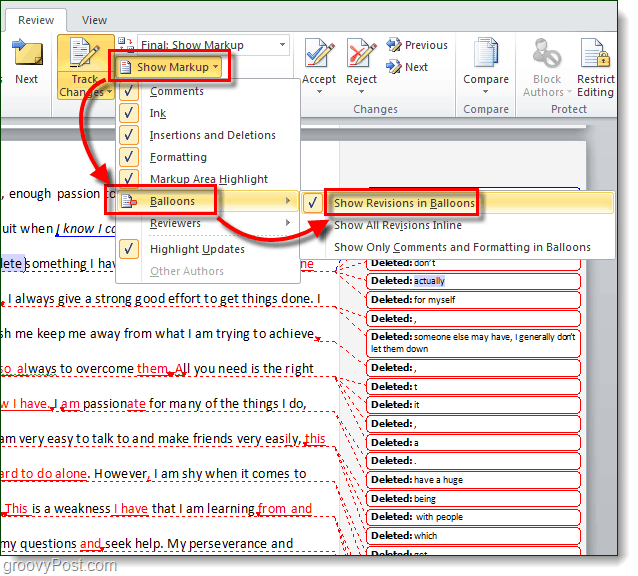 The Review ribbon in Office 2010 is a useful tool for collaboration, writing and editing. In Word 2010, the Track Changes tool is especially useful and a must have for anyone who needs to edit a document and track changes / revisions. Its change tracking is concise, easy to see, understand and apply. I’m an attorney and I spend most of my day using revisions tracking on contracts. Does word 2010 give me anything word 2007 doesn’t? 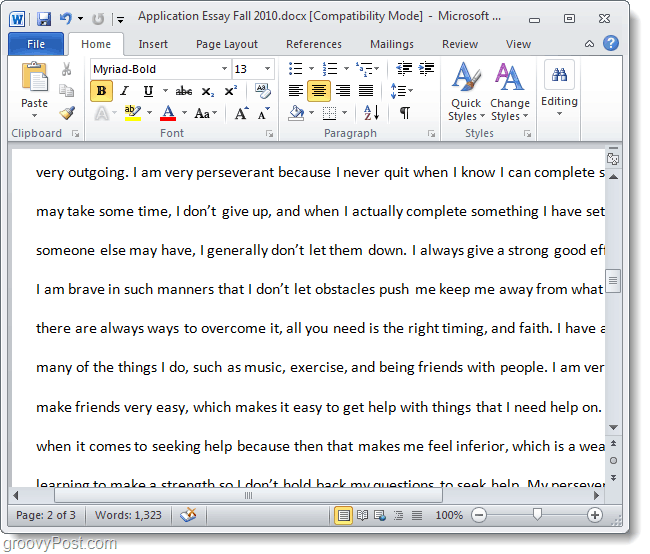 So just did a screen by screen comparison and no… the features have not changed at all between Word 2007 and Word 2010. The ONLY thing I see that’s different is on the ribbon, there is a Balloons button on the ribbon for Word 2007 however on Word 2010 the Balloons button is hidden under the Show Markup drop down button. So yeah, NOTHING has changed. I used Microsoft Word 2010. I am not new to this, however, this is the first time I have lost a document. I wouldn’t mind but it is 6 pages. I usually have the problems when I go to Edit it, it tells me read only. Can you help me with this. I understand that it has something to do with the ribbon, if so please tell me exactly what to do to correct it please. How exactly did you lose the document? Did you ever save it? I am desparately trying to change the time stamp in track changes in the 2010 version. My Microsoft default is set as “2/9/12”, but when I hover over the name in a tracked change, it appears as 09/02/12. I’ve checked with Help and can’t find anything. When I sent this same document to a user who has Word 2007, the date format was correct. This has to do with the way your PC records the date. US uses the month, day, year sequence while rest uses european order of first having the day, then the month and then the year. Your PC will display it according to your set up. This is why it will appear as 09/02/2012 on someone else’s PC. Sugget you go to control panel and check out the Date/ region and language settings. Then choose the time sequence you want and from then on you will see all the changes will be automatically made. 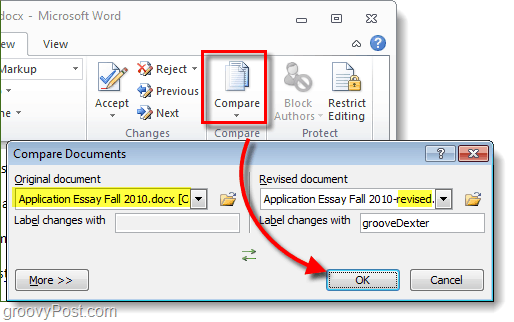 you cannot change the date stamp in Word or in the Review function. It uses the settings you chose when you first installed your software and set up your profile. Great document-very helpful. Thank you. Your very welcome! And welcome to the site! So, I’m using two sets of track changes in a document I’m currently editing. (A copy editor’s and my own.) All is fine (I see my own, and I see the copy editor’s) until I save. When I save, my track changes turn same the same color and user name of the copy editor’s, even though my name is associated with the Microsoft Office install. Any clue why this would happen and what I could do to make it stop? Please share the answer with the rest of us Thanks! is it possible to change (or better) to remove the text “Comment” from a balloon? so that you just have the text of the comment? I prefer the balloon presentation for both comments and changes too, but at the moment I have to turn on “Show revisions in balloons” manually every time. Can you tell me how to make this the default, in place of the current default, which is “Show only comments and formatting in balloons”? I have the same problem. Did you find a work-around? Does anyone know how to make this option permanent? I had the same problem and it is really annoying to see that the ““Show only comments and formatting in balloons” option disappeared. Why change something that works so nicely??? The workaround that I found is to disable balloons completely — that way you see ins/del inline. Comments are then shown with a red highlight and a . If you mouse-over a comment you see its text. Right mouse click gives edit comments, but this opens the ugly Review Pane. I hope Microsoft will put this option back. I just finished commenting on a voluminous document and tried to accept changes but nothing happened. I fear I may not have “enabled” track changes before actually making proposed changes. If this is true, is there any way to enable “track changes” so that all comments and proposed changes will not have to be re-typed? If your changes aren’t showing in highlighted colors, then you didn’t have Track Changes enabled. However, your changes are there – they’re just not highlighted as changes. You only need to use Track Changes where you intend for someone to review (and accept/reject) the changes before they are finalized. Tks for taking the time to respond. My sense is that the best way to proceed is to have my “revised” doc serve as the base text and ask reviewers to enable “track changes” and record there comments. I can then incorporate their remarks using the Track changes tool and then manually include my initial comments. Why does my document always open with the Track Changes feature automatically on. It opens certain documents in “Final: Show Markup” setting with a blank review column to the right. I can’t get it to go away no matter what I do. Help!?!?!? Please and Thanks! I use this everyday now. Thank you! How do I restore myself as the first editor? 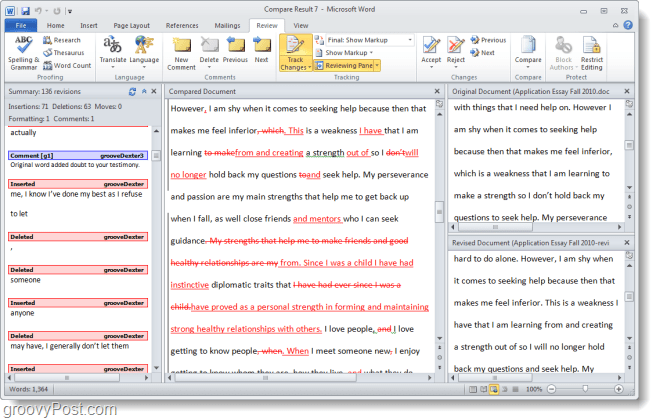 I was editing a document as the first (and only) editor with my comments in red appearing as usual. At the end of the day, I turned off my computer, but when I started it up the next day and opened the document, all my previous changes were in blue as though a second editor had done them. I then checked what would happen if I opened a different document and started editing it. This one too would not note my changes in red as the first editor. I find it so anoying. Please could you explain how I restore myself as the first editor to see my changes in red. Note: I am the only one who edits on any document and no one else has access to my PC. I also didn’t change the profile or any other settings on it. Henriette, did you ever get an answer to how to restore back to first editor? I have the same problem. Multiple reviewers, I was red, now I am purple (hard to read). I’m dealing with the same problem. I need it to be blue instead of purple. It was blue when I originally opened the document and started to make my changes, but once I saved it, it turned purple. I’ve been searching for hours on how to change it and can’t find anything that makes sense. Elena, I figured out a “work around” in Word 2010. The color I needed was blue and not purple. 8. When you change the username again, add a number 2 at the end. (ex: Angela2) And continue to add a new number at the end of your name each time you change it until the lettering you type is blue. Conclusion: When you change the username about 4 or 5 times, you will see the color change each time and it eventually cycle back around and turn back to blue. The previous changes I made are still in purple, but all future changes will be blue :) :) :) YAAAYYYY! I never thought I was going to get this to work for me. I hope it helps you too!!! I don’t have Word 2010 installed but looking at Word 2007 and Word 2013, there appears to be an option to customize this. 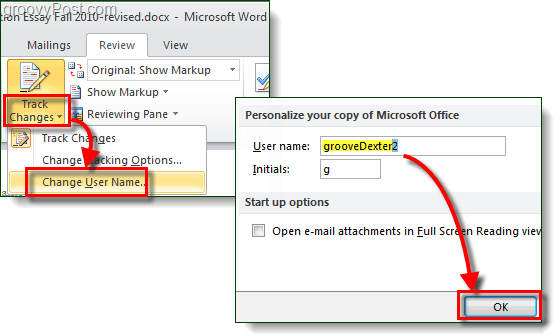 For example — Word 2013 Click the Arrow in the corner of the “Tracking” ribbon (https://www.groovypost.com/?attachment_id=77652) and then Click Advanced Options. From there you can customize all the author settings and colors. Same goes for Word 2007. Here is where you can access it on Word 2007 https://www.groovypost.com/?attachment_id=77653. My Guess is you should be able to find a similar option with Word 2010 as well. Steve, thanks for taking the time to reply. I thought I figured it out, but when my computer rebooted, the colors got all jumbled up. The original color my editor used was red, now mine is red and her’s is purple. Mine is supposed to be purple and blue because I ended up having to use two separate usernames to edit with, due to it originally turning purple. I’m inserting edits with the same username as before the computer rebooted. This is making it super confusing. I looked at what you mentioned many times over but there is no option to change the color for the individual user unless I add a user again… which I had already done. And, as mentioned before, once my computer rebooted, it jumbled the colors up again… I think I’ve tried EVERYTHING to fix this – and I’m relatively computer and Word savvy. It might be an error on Microsoft Word’s part that really needs to be fixed. Superb workaround. A default purple font was driving me nuts! thanks for sharing! I am wondering if there is a way to accept the changes in a color other than black, without having to format each edit in that different color (say red). I understand that the edits appear in red (or another color if there are multiple authors), but once the text is accepted, it is black. I would like to be able to see where I input new text, after I have accepted changes. Hope this makes some sense. The way the system works is once you accept the change, word no longer tracks it. Only other option is to manually change the color or add a color or not accept the change until the final document is ready to be saved and communicated. I have made a copy of a document that is a template (not a *.dotx template) for creating design documents that has “Track Change” turned on. I want to modify creating my initial version for the project & once completed use that point in time to track changes. Is there any way to change the track options on a comparison document? So if you have two documents up and you want to change the track settings on the comparison doc, (ie colour, how it appears) is this possible? Or would you just change it on the original document and it will then replicate over to the comparison doc. Great – just the solution I needed (use different colors by slightly changing the editor name). Thanks a lot! No problem and thanks for the feedback Christine! Let’s say I am working on a protected document from a user, and I am not allowed to unlock it. I make edits over the course of several days, and on the last day, I discover I want to “undelete” something I had marked two days earlier. How can I accomplish this? I don’t see any way to undo my own deletes. I am using track changes option in 2010.My addtions are in red colour and deletions or in strike through blue color. Now i need to take printout of document with addtion only.I dont want to include deletion.How can i do that? Your instructions on how to allow a uniquie track-change color for each author are clear enough. Still, when I change the user name as instructed and then alter the existing track-changes color (blue) to a new color (red), the existing changes appear only in the new color (red). Any suggestions? Thanks in advance. I received a word document and made amendments to it. My amendments are in red colour and the amendments made by a previous reviewer is purple. I also noted my name and “author” as reviewers. There are no other names listed as reviewer. After saving, all my amendments were changed to purple colour and I am unable to tell the difference between my amendments and the previous reviewer’s amendments. And under the reviewers name, my name also disappeared and only “author” is left under the reviewers names. Is it possible to re-set the setting to ensure all reviewers amendments even after saving will retain different colour coding. i am using microsoft word 2010 and 2013.
i would like to edit the document with using different colour. Mr. Ruthruff. Can you please answer this question? Another person and I are editing 1 document. I was the originator of the document, and sent it to her. She then turned on the “track changes” feature and her edits are in red. (no prob) When I originally opened the document and started making my changes they were blue (no prob), but then I saved the document and they changed to purple (problem). How can I change my edits back to blue? I’ve been searching for hours on how to change it and can’t find anything that makes sense. After I make changes or comments to a person that has sent me a document, do I have to save my changes and then email back to them, or is it done automatically? Hello there, I recently upgraded to Windows 10 and while editing a document, decided to make a second file called CLEANWITHCOMMENTS, thereby Accepting all Changes and leaving the comments for the author to answer. BUT all the original track changes on the original file have disappeared!!! HELP how do I resurrect my track changes please??? Am a Luddite. I am lost. I am a secretary thus I type up documents and send for approval. I need to track the changes they’ve made to my document and send out the amended copy. I can’t get word to show the changes they’ve made. help!